I’m not a spontaneous person but occasionally force myself out of my comfort zone to advance myself. At these points, I will decide I am compelled to do something specific that involves risk or is indulgent. A small incident stays in my mind as a metaphor for this and I really flubbed it. My then relatively new boyfriend took me to North Georgia to meet his family and a well-meaning relative brought up something from his past that made us both woefully uncomfortable. I was polite while wanting to scream. I wanted to shed this discomfort and decided right then and there, I must race down the dock to dive into the sun-dappled lake. As I pounded bare feet on the boards of the dock, I felt on the precipice of liberation and anticipated the cool, cleansing waters. It would be just like that scene in “On Golden Pond” when the frustrated daughter frees herself by diving in the lake. I got to the end and propelled my body out over the water using my best racing dive from childhood and exulted in the expectation of refreshing cold water. Instead, my body sliced into very warm water that clung to the top of the lake. Because of the racing dive, I slithered into the hot water above the anticline and felt heat embrace me like a warm blanket. Disappointed to say the least, I opted to make the best of it or at least tried. I demonstrated to my boyfriend my chops with the butterfly stroke and enjoyed the view of the lake. I rationalized it was still refreshing to get wet. Sometimes the fantasy is better than the reality. Likewise, sometimes a dream realized takes awhile to manifest in real life. We all have regrets and mistakes we can count. When I first moved to Texas, I knew I was taking a big chance that I would not like it and at first I flubbed some things at work and personally in that I clung to my past and definitions that applied then. When I let go and learned to learn again, I expanded my life. It was like flopping into hot water on the lake but coming to love the place, people and opportunities. Years later, I felt compelled to make another major change, but I did not know how. I was working in an office building downtown and would ritualistically make my way to lunch in Houston’s tunnel system. Typically, I wouldn’t venture far and go to my favorite Vietnamese place for pho. I became addicted to the tofu curry too. Across the way from the lunch table was a store that sold all kinds of cutesy accessories, like koozies for wine glasses and cheap bangles. Ladies, you know what I’m talking about: pink and green zebra print picture frames and the whole genre. A faux chalkboard paint sign beckoned to me, day in and day out. 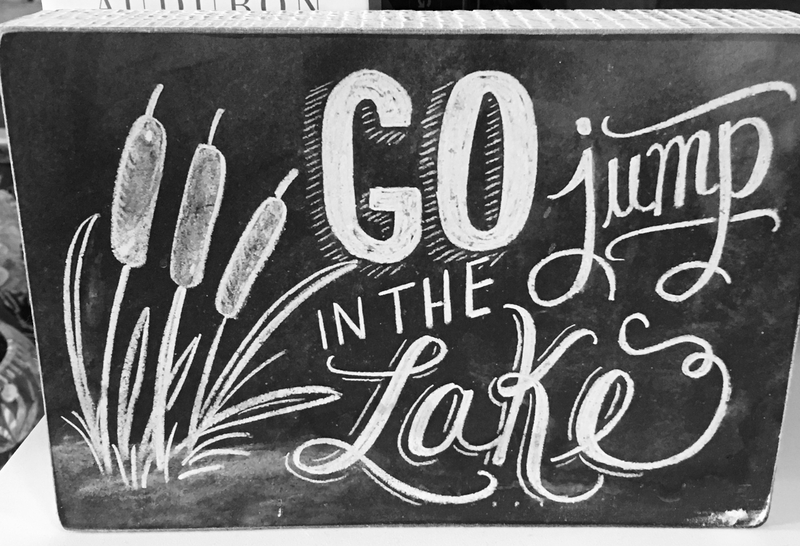 It says, “Go Jump In The Lake.” This tended to make me smile or grimace when recalling the hot water incident. Then I reflected on the temptation to go jump in a lake. The need to go jump in the lake of life. The desire to make another major change. I just didn’t know what it should be. But I would worry too about poor choices past and how sometimes there is no recourse. The anxiety and inertia would hold me in the comfortable place. One day my boss asked to speak to me privately. The conversation was surprising and yet logical. The upshot was I had an amazing opportunity for which I am very grateful. Had this change in direction not be considered, I would not have jumped into the next lake. I’m still swimming around in water that sometimes doesn’t feel as comfortable as I would like and trying out different strokes. Later, I started my own business and just keep taking more strokes. And, oh yeah, I went back to buy that “Go Jump in the Lake” sign. Don’t hold yourself back. Reclaim your life.